If you are not aware, in North America, October is Pastor Appreciation Month. Just like Christmas time, where retailers brandish their goods and up their advertising ante, Christian retailers take advantage of this special month to encouraged congregations all over the country to buy something for their pastor(s) as a token of their appreciation. I have received several emails from Bible software companies like Logos and Accordance Bible. There are special deals from the major publishing houses for members to buy books for their pastors. 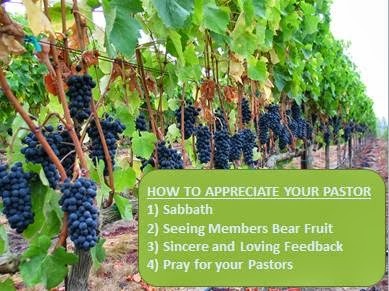 Just do a search on the Internet and you can find many different ideas on what to do to appreciate your pastor. Giving things is nice. Most pastors I know will however appreciate something more than things or material goods. This week, I like to reflect upon four things that pastors will surely appreciate. The word "burnout" is commonly used. Even the most rested person will from time to time appreciate a time out from ministry matters. One of the traits of pastors is that they tend to overwork a good work. Their tendency is to rationalize that a good work is thus worth doing absolutely well. So they burn themselves out like a candle on both sides. They tough it out with little sleep. They give up time with their own family so that they can visit their Church members more. I came across a story not too long ago about a kid asking his busy father how much he earned per hour. With his eyes busy on the computer, he told his 8-year old son that he charges his clients $100 per hour. As he clicked his mouse and typed on his computer keyboard, he did not notice his son leaving the table. After a couple of minutes, the son tugged on the father's shirt and said: "Can I borrow $20 from you?" The father replied: "Just go to my room and take it from my drawer." After a few more minutes, the son returned with a wad of cash. He counted $100 and gave it to his dad. "Now dad, here's a hundred bucks. Can I have an hour of your time now? Please?" With tears in his eyes, the father realized what had happened. He had neglected his own son in the midst of his busyness. Pastors too experience lots of struggles especially with family time. Billy Graham reflected on his own life as a Pastor's Kid: "PKs often have difficult, if not disastrous, periods in their lives. Maybe people expect too much of them because of their parentage. Or maybe they themselves expect too much, making unreasonably high demands on themselves in order to live up to others’ expectations." This expecting too much of oneself becomes worse when one is constantly driven by busyness. Ken Shigematsu recently published a book where he calls the Sabbath an "oasis for the body and soul." He writes that keeping the Sabbath essentially gives oneself "permission" to step away from busyness. Congregations can regularly persuade their pastors to take a regular Sabbath at least once a week. As a pastor myself, I can attest to the fact that what encourages people in the ministry is changed lives. That was the prayer I had many years ago when I was in charge of organizing an Annual Christian camp. I prayed: "Lord, if you will, show me at least one life that has been changed." I shared at the end of the camp that God showed me more than one person whose lives have been touched by God. I was elated. In ministry, it is very discouraging to see people who are not hungry at all for the Word. There are people who are content with being Sunday Christians. There are people who complain a lot and still hardly give a cent to the Body of Christ. Then, there are also those self-righteous kind of people who always seem to give the impression that others are worse than them. These people are leeches that test the patience of pastors. In contrast, I know of several brothers and sisters in my Church who will run the extra mile even without being asked. They will take the initiative to volunteer. They will step up and take charge. They do not need special coaxing to get them to serve. They will serve, and take initiative to do good for other people. Let me say, these very people energize me and encourage me absolutely! Members bearing fruit recharges the pastor's spiritual batteries in a very special way. Think about it. What do most pastors pray for in their Churches? Let me share what I pray. I pray for changed lives. Third, pastors preach and teach a lot. Sometimes, the longer they teach or preach, the lesser the feedback. I know that from experience. After a while, people get used to me. They no longer feedback as regularly or as detailed. Sometimes, I like to think that I have improved. Maybe I have. Maybe I have not. The point is, pastors and preachers will appreciate sincere and loving feedback, both positive and negative. I think that is a healthy request. In order to encourage and appreciate your pastor, provide him or her one positive as well as one negative feedback. This will not only help us maintain a proper balance in our feedback, we can also be fair in our comments. It is not easy to give criticisms. For pastors with a stubborn heart or a prideful spirit, it gets only tougher. Before you go and share with your pastor about anything, pray about it. Sense the best timing. Prepare your own heart. Learn how to speak the truth in love. If you can only remember one thing, remember this: Pray for your pastor. There is no greater gift than to take it to the Lord in prayer. This not only prepares your own heart, it also allows God to teach and guide the servants that He himself has called to serve. Let me close with this touching sharing by Jim Savastio, a pastor of more than 25 years, and how he has been blessed by the flock he served. Blessed is the pastor who has a Church like this. They will be most encouraged. They will feel most appreciated. There are many more ways to appreciate your pastor, but the four I list will be sufficient for the most part. Feel free to share with me more. THOUGHT: One of the biggest challenges for any pastor is to remember that no amount of good he does can ever be more than Christ has done. At the same time, no amount of inadequacy he feels or the guilt of not doing enough can ever escape the grace of God. Understanding the grace of God means know when to push and when to let go; when to take up and when to put it down; trusting that whichever decisions made, the results are always up to God.